Today we look at the signing habits of music and movie superstar Barbra Streisand. 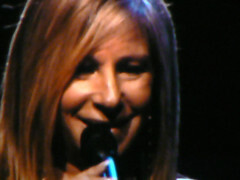 Ms. Streisand. I have been fortunate to meet her on four separate occasions and each time she has been fantastic! She signed autographs for every fan who asked her for one. She chatted about various topics and was very charming. Most people seem to be surprised when they hear how responsive Ms. Streisand is with autographs. Apparently her reputation is less than stellar in this regard. I can only report to you what my experiences have been and, as you have read, they have been fantastic. If you ever run into Barbra Streisand ask her for her autographs. You won’t be disappointed. This entry was posted in Uncategorized and tagged Arthur Laurents, Autograph, Barbra Streisand, Collecting, Individual Collections, Recreation, Seth Rogen, Stephen Sondheim. Bookmark the permalink.